The discovery of this matchbook cover a few months ago had me on the lookout for a Morrison “Patriot” Fountain pen. I finally found one recently, and proceeded to work on it’s restoration. This is the only piece of fountain pen ephemera that I have found on a matchbook cover. I suspect that there are others out there and if you have some, please comment. Here is a photo of the same pen depicted on the matchbook after I took it apart. This photo shows the syringe filler, still attached to the section. As you can see, the barrel is quite dirty and the gold furniture is tarnished. I used a bit of heat and was able to twist off the syringe tube ~ it is friction fit to the section. The plunger can be pulled out through the front after the plunger grip is unscrewed. The photo below shows the filler after it has been taken apart and the cartridge has been cleaned out. The dilemma with these pens is that the filler was never meant to be repaired..just used through the limited life of the pen. So, in repair, there are a few options. First, one can repair the filler to its original condition and this involves rebuilding it by repacking the cartridge and rebuilding the plunger washers. Secondly, one can simply turn the pen into an eyedropper. The section screws into the barrel and a seal could be developed. Third, a sac could be attached to the section and the pen could be simply filled by squeezing the sac and then attaching the barrel. Fortunately, I had a simpler solution. 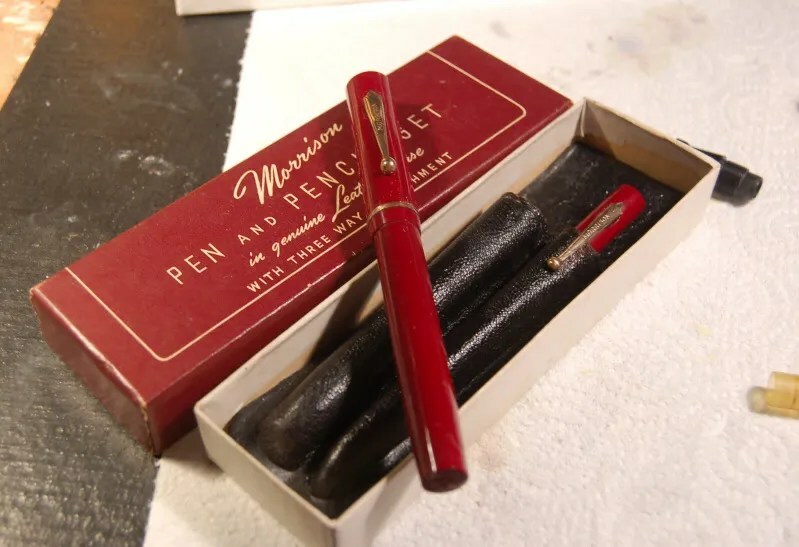 I have had the Morrison set below for about 10 years sitting in the back of my pen chest and when I checked its filling system, it was the same. I was able to take the filler unit off of the Red Morrison and shellac it to the Army Patriot. Here is the filler below after the switch and water test. I shellacked the unit to the Patriot after fully cleaning the section, nib, and feed. After the shellac had dried, I water tested it overnight to make sure that the seals are still effective. There was no leakage in a 24 hour time period and the unit was ready to be reinserted into the pen. First, the barrel and cap needed a good cleaning, as did the gold clip and clip ring. 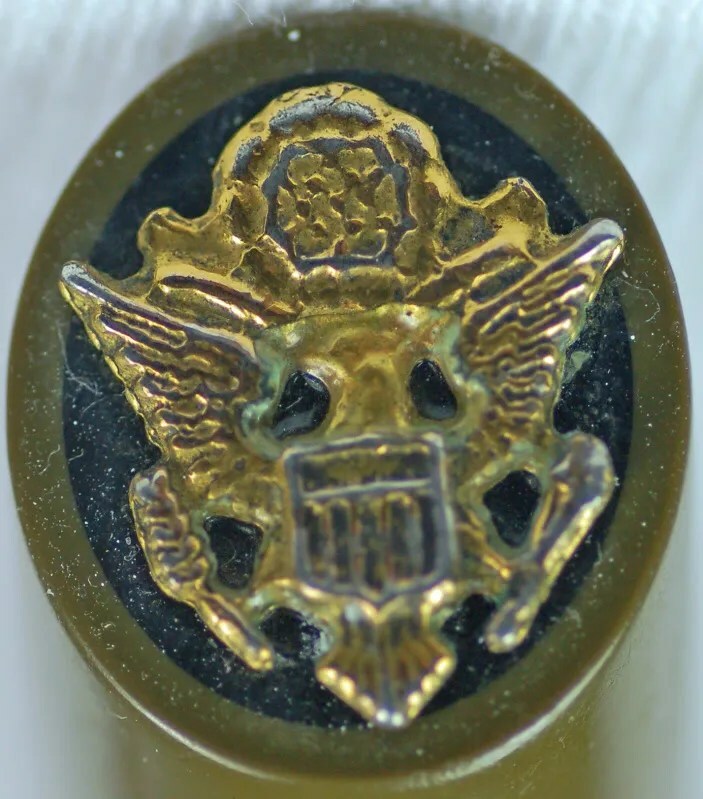 Do not attempt to clean the Army insignia at the cap top as it is covered with a very thin gold plate. The rest of the furniture may be polished. Below, is the completed pen, polished and ready to write. Here is the cap top logo of the US Army. 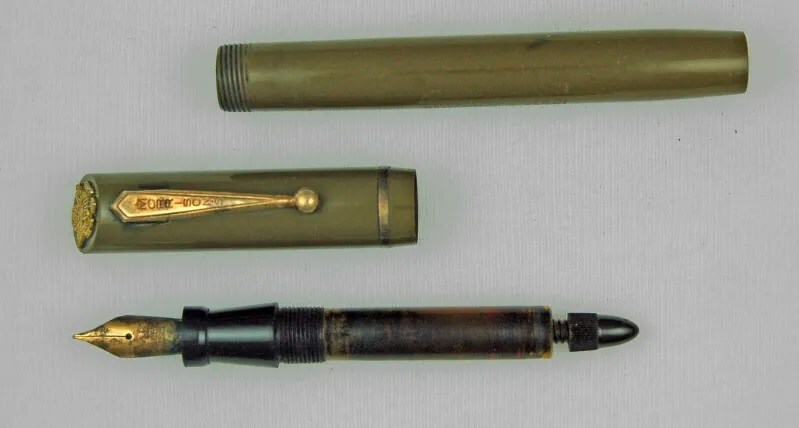 These Morrison Pens also came with cap tops of the Navy and Air Force. (Thank you to richardspens.com for this information) You can see the gold plating on this logo has worn down over the years. These pens were produced during WWII and marketed to the general public, appealing to the patriotic fervor of the time. The matchbook states that they could be a “GIFT FOR MEN IN THE SERVICE”. In fact, they were not military pens as they did not meet the military code for pens, having clips that were not military issue. For a quick overview of Military Clips, refer to my post of March 21, 2008, Sheaffer Skyboy Surprise . The nib is a large 14K nib in medium point. There is no Morrison marking on mine and I do not know if this is common or a replacement nib. Morrison certainly had their own marked nibs on earlier pens. Here is the logo, highlighting the unmistakable Army Green color. The pen measures 5 3/16″ closed and 6 1/2″ posted. As the matchbook shows, this was sold for $6.25, including pencil, which is missing from my pen. In my experience, the Army pens are more commonly seen than the Navy or Air Corps. I have no idea whether this relates to the manufacturing numbers or not, but it does relate to the number of US Service Men and Women. The number of Army and Army Air Corps personnel significantly outnumbered the Navy during World War II. 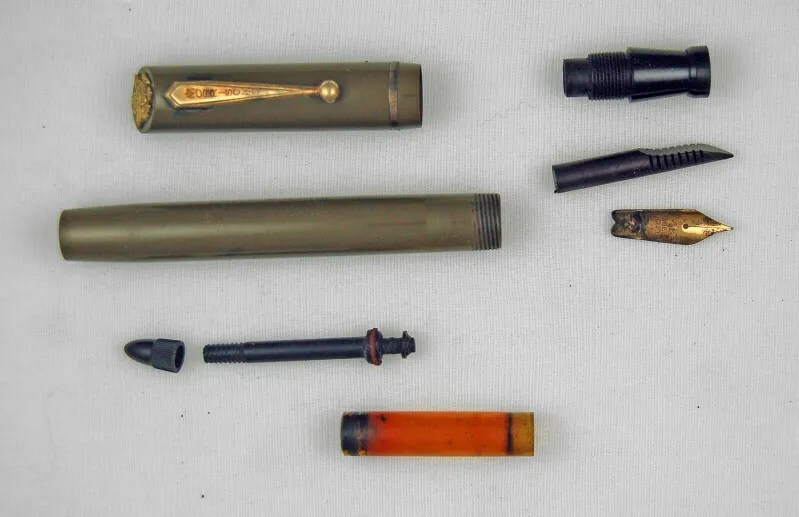 As with V-Mail ink, reallocation of Pen Factories machinery and materials, and Military Clips, this is another interesting part of Pen History during this time in United States History. This is more a question than a comment. Did the Navy Patriot Pens come in dark blue? Or were they black? I’ve acquired a few of them and they are all black, even those that said Navy Blue on the E-bay sales site. So, I’m wondering if the blue has faded to black over the 60 years? Or did they start out black?